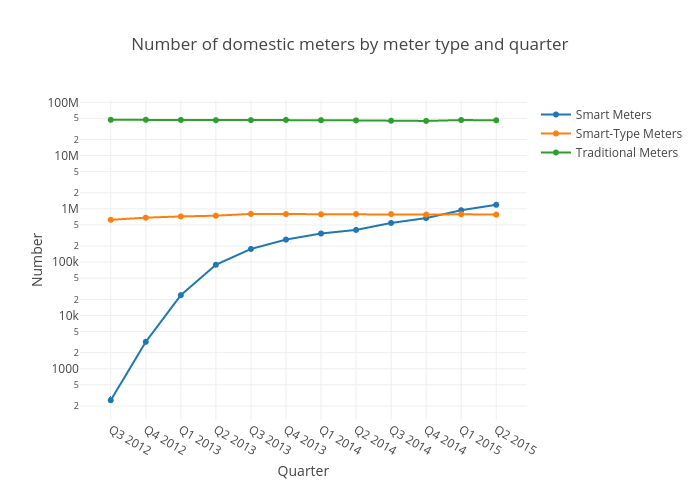 Thedimlebowski's interactive graph and data of "Number of domestic meters by meter type and quarter" is a scatter chart, showing Smart Meters, Smart-Type Meters, Traditional Meters; with Quarter in the x-axis and Number in the y-axis.. The x-axis shows values from -0.5150360016941974 to 8.515036001694197. The y-axis shows values from 2.0375845609093317 to 8.043140480342526.